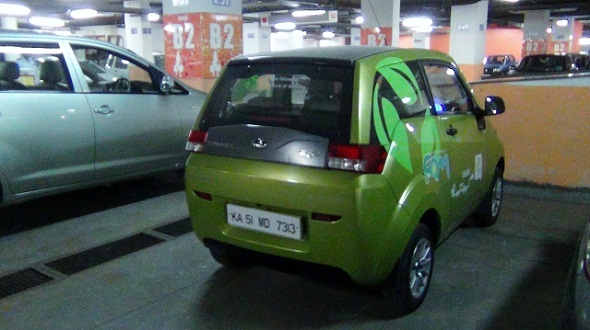 On the third and final day of living with the Mahindra e20, we put it through a regular urban cycle with a visit to a mall, a local shopping complex and some tight spaces. In this cycle, the behaved just as one would expect any normal car too, although there are some things we wished for. Day Three began with the car showing 97% charge on the instrument cluster by about 3 pm. We had finished charging the car to 100% by 12.15 am, but in about 15 hours of standby time, the car had lost about 3% battery. It was left out in the sun – and this brings us to the first thing on our wishlist. How about incorporating a small solar panel in the roof of the car which could trickle charge the battery? (That’s something Mahindra is apparently working on). That would ensure the battery doesn’t lose charge or at least gets a small top-up when parked in the sun. Of course, one can also buy the optional 10 ft x 10 ft solar charger for about Rs. 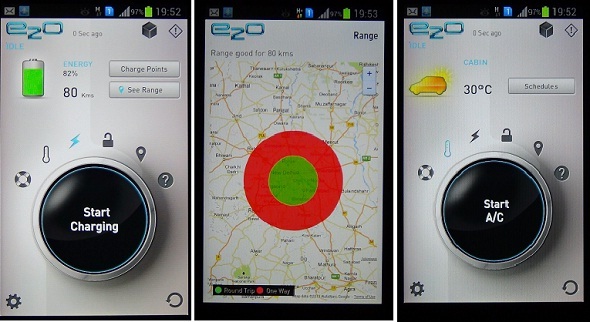 1 lakh and set it up at home or office to charge the car, although it takes longer than a regular electric connection would to charge it. Now the dimensions of the Mahindra e20 make it really convenient to use in traffic as well as crowded market places. It’s slightly longer than a Tata Nano, but is also a little narrower, which means it can squeeze in easily in to tight spots. However, in malls where there are parking spots for SUV sized vehicles, this little Mahindra e20 really looks a little too small. That said, it also brings us to the second thing we wished the car had – power steering. Although the steering of the Mahindra e20 is easy to turn once the vehicle is in motion, at parking speeds (like the Tata Nano) it takes some effort. At the price point at which it is selling, it really needs electric power steering to make a convincing case for itself. On day three, we used the AC constantly. The AC was on even when the car was stationary at market place for about 15 minutes, as it had passengers in it. With that kind of AC use and stop-and-go traffic, we found the car consuming about 1.5% battery power for every km it ran. So much so, that for a 10.5 km round trip, the battery charge came down to 83% from 97%. Now this is the kind of use that the car would be put to in everyday conditions – if one buys this car for just running around town. If your daily drive is within 60 to 70 km, you can safely pick this car and bring your running costs in the first five years of the car’s life down to just Rs. 0.45 per km.